So they celebrated a week of being committed. 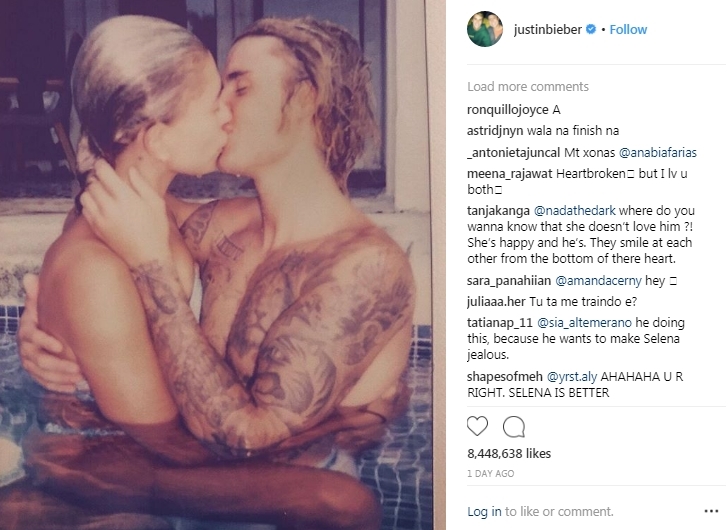 The newly engaged, Justin Bieber and Hailey Baldwin , are in full honeymoon long before the wedding occurs. The 24-year-old singer posted on Instagram a photo of him and the 21-year-old model melting into a hot kiss in a whirlpool, debuting as a couple in social networks. Justin was wearing a white swimsuit and Hailey was wearing a blue and white bikini. It is not clear when the photo was taken, perhaps it could have been during his trip to the Bahamas. “Damn it … but who took this picture? …” commented his manager Scooter Braun. Before publishing this image, Justin dined with Hailey and David Grutman at the Komodo restaurant in Miami. Jaden Smith, who is in town for a presentation at the Liv, came to his table to greet them, reported E! News . Justin and Hailey flew to Miami from New York that same day, in a private jet, wearing new watches made especially for them.